I am behind my time to write about Shakespeare, about the plays, about “what Shakespeare means to me.” I am way behind in my writing in general, so this blog for Will is, perforce, short but I hope sweet. A is for the Alliance of Airy Sprites and Articulate Dames…. E is for the End…. 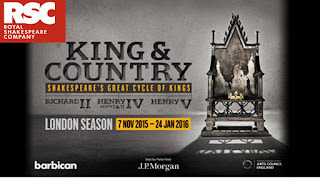 This spring I’ve just see the Royal Shakespeare Company’s “King and Country: Shakespeare’s Great Cycle of Kings,” comprising Richard II, Henry IV Part I, Henry IV Part II, and Henry V, playing in repertory at the Brooklyn Academy of Music. No matter how many Shakespeare plays I’ve seen, I’ll see them again in time to come. Some will disappoint, some will exhilarate. The plays, the good ones (no, they’re not all good) can weather all manner of interpretations, edits, stagings and filmings. I rejoice in them. My recent breakfast reading is The Year of Lear: Shakespeare in 1606 by James Shapiro, about the events in England the year preceding Shakespeare’s writing of King Lear. Fascinating background reading that put me in mind of last summer’s production of The Tempest in Central Park as I read Shapiro’s description of Ben Jonson’s Masque…everything’s connected. 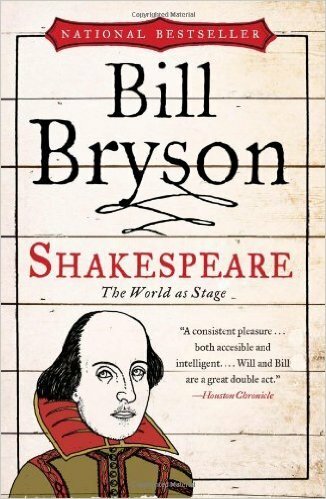 Also reading Bill Bryson’s Shakespeare: The World As Stage, just for fun. As always, thanks, Will. The world would have a paucity of wondrous, witty words without you. ~ Molly Matera signing off to write about the Great Cycle of Kings playing in repertory at BAM until April 30th. And after that, to watch The Hollow Crown with the same four plays on film.